There are two types of rowing. In sculling, the rowers have an oar in each hand, while in sweep rowing, they have both hands on a single oar. Team rowing is usually in teams of 2, 4, or 8. In teams of 4 or 8, there's often an extra person in the boat called a coxswain who coaches the rowers and steers the boat instead of rowing. Focus, fitness and unity among all the rowers is important and keeps the boat set and fast to the finish. In the Fall, rowers race against the clock in 5,000 meter races. In the Spring, rowers race head-to-head in 2,000 meter races. Rowing is the oldest college sport in America. In the U.S., one of the biggest events in rowing is the Harvard/Yale race, which was first held in 1852. In England, the big event is the Oxford/Cambridge race, first held in 1829. Modern crew boats are called shells, and are constructed of a carbon fiber that is very light in weight. Shells used for teams of 8 are about 60 feet long! Rowing gives an athlete a great workout on both the upper and lower body, and is a low-impact exercise. This is why rowing machines are so popular at the gym. Many coxswains are girls or guys who are a little bit smaller or lighter than their teammates. So if you're worried that your lack of height or weight means you can't be involved in team sports, this may be the perfect position for you! ACRC coxswains participate in cross-fit activities, so you'll stay fit too! There are two basic types of boats - Sculls (each rower has two oars) and sweep boats or shells (each rower has one oar). ROWER POSITIONS (SEATS):Each seat in the boat is numbered according to its position going from bow to stern. In an eight the seats would be 1 to 8 & cox. Two seats, however, are more commonly given a different name. The #1 seat, that closest to the bow, is called "bow seat". 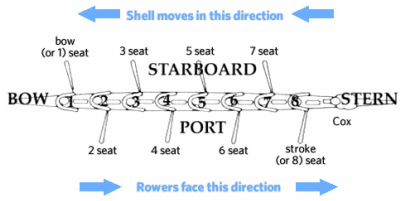 The rowing seat closest to the stern is called "stroke". Rowers are often called by their seat number, both by the coach and coxswain, so always be aware of your seat. Additionally, rowers need to be aware of which side they are rowing, whether port or starboard as rowing commands are often given by side, such as "check it on port". Hull - the actual boat. The hull is very thin and fragile. It scratches and can be punctured easily. Be especially careful when moving the boat, always listening to the commands of the coach and the coxswain. NEVER step over the hull; always walk around. Decks - there are both stern and bow decks on the shell. These decks form compartments to trap air for flotation in the event of swamping or flipping. Vents - There are vent hatches in both the bow and stern decks. When closed they trap air; when open they allow air flow to dry out any moisture in the fore and aft compartments. It is the responsibility of the coxswain and bow seat to close the deck vents. There are often vent hatch covers under the seats also. These allow access for adjustments to the seat tracks. Keel - runs the length of the hull, down the center, for structural support. Ribs - run perpendicular to the keel, against the hull, for structural support. A lifting point. Foot Pad - space between the front of the tracks that is the only place you step when entering the boat. Gate - screw-down rod that keeps the oar from coming out of the oarlock. Shaft - the long straight main section of the oar; usually composite. Blade - the flat part of the oar that enters the water. Either hatchet shaped or, in older oars, tulip (Macon blades). Handle - the oar part you hold on to; may be wood or composite with rubber grips. Clam - a clip-on plastic piece that fits against the collar adjusting the load on the oar. Let It Run - A call for all rowers to sit with blades off the water at the finish, allowing the shell to glide through the water. Done correctly, the boat will be set (balanced) and no blades will be touching the water. A good drill for correcting set problems, especially those related to lean and handle heights. Power 10 - A call for the rowers to take "power" strokes, giving it everything they can for a certain number of strokes. This is used in races to make a move on another crew and, in practice, to build stamina and let rowers realize both how hard they can pull and how that affects the boat's speed. Can also be a "Power 20" or more.